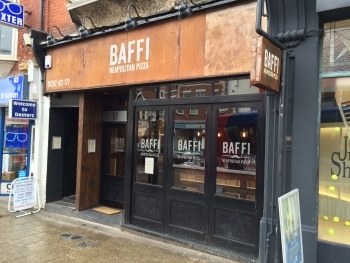 Bournemouth Borough Council: Pure Town Planning are delighted to have secured planning permission for a replacement shop front and relocation of an extraction system at our favourite authentic Neapolitan-style pizza place in Bournemouth – Baffi in Southbourne. Our client is very happy as the consent replaced the previous tired shop front with a contemporary modern shop front in line with the pizza chain’s brand image and was considered by the local authority planners to enhance the character and appearance of the conservation area. In terms of the extract flue, Bournemouth Borough Council had been attempting to remove the existing flue system for some time in order to improve the character and appearance on the conservation area. After a lengthy consultation period we were able to negotiate a suitable relocated position which satisfied all parties. It is very pleasing to be able to assist a fellow local business negotiate their way through the complexities of the planning system. We know that often relatively modest changes such as this can make a huge difference to a business. If you own/run a commercial premises and are considering potential development involving changes of use, signage, advertisements, extraction systems or any other related works, then we would be happy to advise you on how best to proceed to maximise your commercial potential.